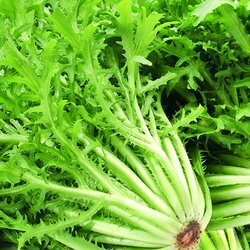 Chicory has long green oval leaves which is the cultivated variety&comma; or leaves with jagged edges&comma; resembling a dandelion leaf which is the wild variety. Both producing beautiful blue daisy like flowers. Leaves can be used in salads and roots as a vegetable or ground and used as a coffee substitute. Roughly 60-80 days once the leaves are about 15cm long.